The first time I walked into Jackson’s, I was instantly reminded of Disney World. That’s not the usual way someone starts off a favorable restaurant review, I know, but bear with me, because it will make sense in a moment. 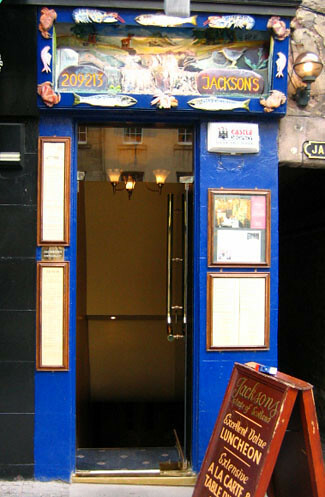 In the middle of Edinburgh’s tourist heartland, halfway down the infamous Royal Mile, buried deep among the uber-kitsch souvenir shops and bagpipe-wielding street musicians, there is a little underground restaurant that by all appearances, seems to be there solely to cash in on the tourist trade as well. You descend some claustrophobic steps into a basement room where the gaudiness of it all threatens to overwhelm you: heavy throne-like wooden chairs, lamps in the shape of torches on the walls, bunches of dried thistles and tapestries depicting scenes of medieval Scottish life decorate your dining nook. The waistcoated waitstaff seem to have been given an extra lesson is graciousness before you arrive, humbly thanking you for everything you let them do (‘May I refill your wineglasses? Thank you very much indeed, Ma’am, Sir’). There’s no Braveheart soundtrack playing on the stereo, thankfully, but there is Dean Martin on endless repeat. If Walt Disney had included Scotland in his World Showcase at Epcot Center – you know, the place with the little pavilions from different countries that try to cram as many clichés as possible into the space of a basketball court – this would be Scotland’s restaurant. Jackson’s Interior the San Angel Inn. I can imagine that Scotland’s restaurant would be no different, if it existed – along with all the bagpipes, thistles and overdone accents, you would be served some pretty decent food. And such is the case at Jackson’s, only you don’t have to travel to Florida to experience it. 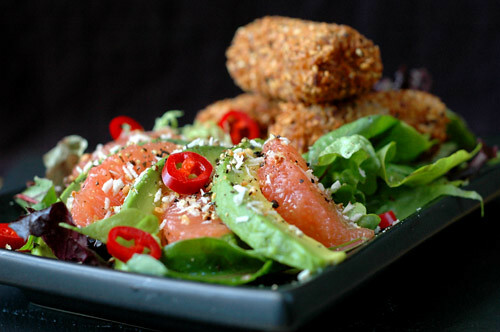 We found ourselves in Jackson’s for lunch last week, lured in by their seemingly amazing lunchtime offer of three courses for a mere £13. I had eaten at Jackson’s once before, treated by a colleague of my mother’s, and we had a delicious albeit pricy dinner. The food had been sumptuous and exciting – I had a duck and pink peppercorn terrine with blood orange sauce as my first course, and possibly the best filet mignon of my life which was served with a roquefort-port wine sauce so good I ended up eating it with a spoon. I believe the bill came to over £100, though I politely didn’t ask for specifics. This time we went there for the acid test, however – there are a lot of restaurants that offer good food for dinner and good deals on lunch, but not many that please you equally no matter what time you go or how much you spend. Luckily, we needn’t have worried. Smoked Venison Saladnot overpowering; the mousse itself was light and creamy and had a complex harmony of fresh herbs and pungent garlic, and it was nestled atop oven-dried tomato halves, whose sweetness perfectly complimented the savory mousse. Manuel’s venison was also delicious and tender, though I could have had some slightly clearer flavors in the accompanying salad. Beef & Peppercorn Pastahappiness over his pasta, which at first seemed a little out of character for the rest of the menu, but fit the standards well in terms of sheer flavor. Drambuie Creme Brulee Cabernet Sauvignon) before leaving – the atmosphere, though jarring at first, had a way of seducing us into sleepy contentment and wisely no one rushed us out the door back into the tourist madness above. In fact, our waiter seemed so sad to see us go that he asked us when we’d be back. ‘Soon’, I promised, ‘very soon’. The Bill: For two lunch menus, a bottle of house wine, a whisky, coffees and tip: £46. Reservations: A good idea for weekend dinners, or anytime during the Festival in August. It all started with frozen yogurt. On warm summer evenings my parents would gather everyone together and treat us to an after-dinner frozen yogurt at a little place down the street. Back in those days the big chains hadn’t moved in – we didn’t have a TCBY, we just had Yumi-Gurt, a tiny shop which was run by a friendly young couple who offered an impressive selection of unusual flavors. I was a picky eater and a typical child in that I turned my nose up at anything remotely healthy. As far as I can recall that frozen yogurt was the only vaguely natural thing my parents could coax into me, and even that was usually full of chocolate. Even fruit didn’t excite me, or so I thought. I probably would have gone on believing I didn’t like healthy things indefinitely, if one evening a chance experiment with a new flavor of frozen yogurt hadn’t shaken me out of my complacency. The new flavor was mango, and that day we fell hopelessly in love. After tasting it in frozen yogurt for the first time, my love affair with mango developed slowly, even modestly. We flirted in bottled fruity drinks, and we exchanged fleeting kisses in occasional tropical desserts. It was a flavor I soon grew to prefer over most others, but for a long time it remained just an abstraction for me, a flavor and a color that could show up in many guises but had no physical referent in the fruit world. I didn’t even know what it really looked like until the day I found one at the market, brought it home and hesitantly cut apart its soft flesh, a much more complicated procedure than any other fruit I had come across. Yet upon tasting it unadulterated for the first time I realized how deep my passion for this fruit ran. Much more intense and luscious than any abstraction of its character, mango in its natural state was simply the most perfect thing I had ever put into my mouth. The problem, as I soon discovered, was that many of the mangoes I found in the supermarket were hard, stringy and astringent, and it became an expensive and frustrating gamble to buy and buy and buy in the hopes that occasionally I’d get lucky. 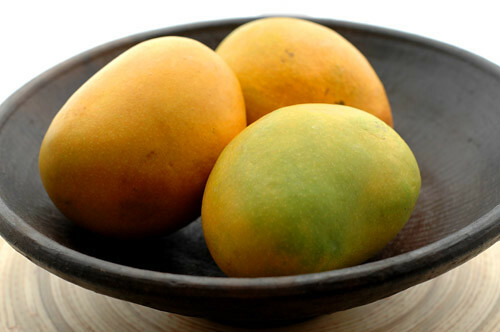 I learned that big supermarket mangoes usually come from large-scale suppliers, who buy certain varieties that have been bred to be hardy in large under-ripe quantities because they must remain shelf-stable until they reach the farthest corners of the supply chain. I was almost at the point of giving up on mangoes completely, having been disappointed one too many times with the dry, bitter specimens I was able to find on the exotic fruit shelves. Then one day, while shopping for spices, I hit upon the solution to my mango conundrum. Small suppliers buy just the quantities they will be able to sell, and consequently they can buy varieties of produce that are grown for flavor, not for durability. Combine this with the expertise of a produce seller who has grown up in an area that grows the produce in question, and therefore has local connections and knows exactly what type to buy, and you’ve probably struck gold. It was mango gold, in my case, as I realized the perfect places to buy them were not supermarkets, but the ubiquitous Indian and Pakistani markets in the UK, which apart from bags of spices and ginger and chilies, sell ridiculously cheap, ripe and absolutely delicious mangoes. For example, last week Edinburgh turned uncharacteristically hot, and with this unseasonable weather for me came an insatiable craving for mangoes. I passed by my usual Pakistani grocery on my way home, and to my delight I saw a large stack of boxes that contained my absolutely favorite variety of mangoes, a long, slender, honey-yellow variety called Sindhri. I love these because they are as tender as custard on the inside with absolutely no fibers, which means you can eat the flesh from each half with a spoon (as they do in India, apparently). They normally start showing up in late May and early June, so seeing them now I just assumed the season had begun a little early this year. I greedily snatched a box and carried it over to the counter. The proprietor, a grumpy middle-aged Pakistani, looked up from his newspaper, eyed my box of mangoes, but then shook his head and waved me back in the direction of the mangoes: ‘get a different box’. ‘Okay,’ I said, hesitantly returning my box for another of the same variety from lower in the stack. ‘No, no, no’, he said as if he were speaking to a stupid child, ‘look at this.’ He came over and yanked the top off the box to reveal six slightly shriveled brown-flecked Sindhri mangoes. ‘Not good, not good, you buy these,’ and removed a box from behind them, across which was written ‘Highest Quality Alphonso Mangoes from Pakistan’. He removed the top from this box to let me fully appreciate the difference: the Alphonsos were smooth, tinged with pink and green, and felt soft and slightly fuzzy, like the top of a baby’s head. ‘You want Sindhri, you come back in two weeks; you want good mangoes buy these now’. I didn’t need to be told twice – the man knows his mangoes. And how delicious they were – Alphonso or Sindhri, the difference is academic, because really what matters is the perfect stage of ripeness. The flesh was a glistening carrot-orange, the texture was like butter, and the flavor tasted like a cross between honey, peaches and freshly-cut flowers. Standing over the sink, mango juice dripping from my fingers and chin, I ate half of the box that evening in a kind of trance, aware of nothing but the intensity of the taste and perfume I encountered in each single fruit I devoured. At that moment there seemed no better metaphor for the fundamental exuberance and abundance of the oncoming summer than those perfect mangoes. But I also did something else with those mangoes the next day, when the summery sun had gone and the rain had returned. It was something that took me straight back to those warm summer evenings of my childhood and that wonderful day at Yumi-Gurt when mango and I met for the first time. I made frozen yogurt, and when I ate it, even the bleary drizzle outside my window seemed to lessen ever so slightly. This recipe is simplicity itself, and really only should be made when you have perfectly ripe, gloriously tasty fruit. The recipe is simple, but you need a food processor, and you should be prepared to eat the results as soon as they are made. This same technique works with other fruit as well, particularly with stone fruits like peaches, nectarines, apricots and cherries. You can vary the dairy ingredient to whatever strikes your fancy: nonfat yogurt works, as does rich and creamy Greek yogurt; you can even create something more akin to gelato by using creme fraiche. If you’ve never cut apart mangoes, here’s the best way to do it: slice off the halves parallel and as close as you can get to the pit, which runs lengthwise down the center of the mango. To get the flesh from each half, score the flesh in a crosshatch or diamond pattern, cutting all the way down to the peel but not cutting through it. Turn the mango half inside-out, and cut off all the protruding cubes. There will also still be some flesh attached to the pit; cut off the thin ring of peel and cut off as much flesh as you can, avoiding any parts that seem overly stringy. Finally, squeeze the pit between your fingers to get the last bit of mango juice from the fibers, and toss this with the cubes. ook forward to. Just peel however many mangoes you have, cut them into approximately 1/2 inch (1 cm) cubes (make sure to squeeze in any last juice from the pit), and spread the cubes out on a waxed-paper lined baking sheet. Freeze until solid, at which point you can transfer to a freezer-safe container if you’re not ready to use them. When you are ready, multiply the following proportions for the number of people you’re planning to feed. Stir together the sugar and yogurt until the sugar has mostly dissolved. 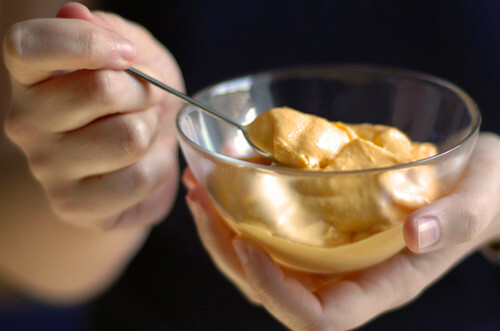 Process the yogurt and the mango together in a food processor, scraping down the sides once or twice, until everything is smooth and has the texture of soft ice cream. Taste it and add the lemon juice if you want it a bit more sour, and a little more sugar if it’s not sweet enough. Give it a final whirr and quickly scrape it into a bowl and eat.